In preparation for the new multi-object survey spectrograph, WEAVE, on the 4.2m William Herschel Telescope, the astronomical community is working on deep imaging surveys to identify the astronomical objects which will be studied later in more detail with WEAVE. WEAVE will allow astronomers to take optical spectra of up to ~1000 targets at the same time in a single exposure, or to carry out integral-field spectroscopy using 20 deployable mini integral-field units or one large integral-field unit. Galaxies, like our Milky Way, can live in large groups with many others, the so-called galaxy clusters. Laniakea supercluster. From Nature The Laniakea supercluster of galaxies R. Brent Tully, Hélène Courtois, Yehuda Hoffman & Daniel Pomarède at http://www.nature.com/nature/journal/v513/n7516/full/nature13674.html. Milky Way is the red dot. Such associations contain a potpourri of galaxies with many different properties such as colours, ages, morphologies and brightness. Among this broad diversity there exists a bewildering population of large but extremely faint galaxies, called “ultra diffuse galaxies” (see e.g., news release “The Puzzle of Ultra-Diffuse Galaxies”), and understanding their properties is important to understand how the environment of galaxies affects their evolution. Since they are so faint, they are easily perturbed by the cluster environment, and therefore are ideal probes to study what happens with galaxies in the dense cluster environment. Using the capabilities of the WFC at the Isaac Newton Telescope (INT) to explore large areas of the sky and detect faint ultra-diffuse galaxies (UDGs), a collaboration of astronomers in the Netherlands and Spain performed a study to investigate these galaxies in detail, the Kapteyn IAC WEAVE INT Clusters Survey (KIWICS). Figure 1. 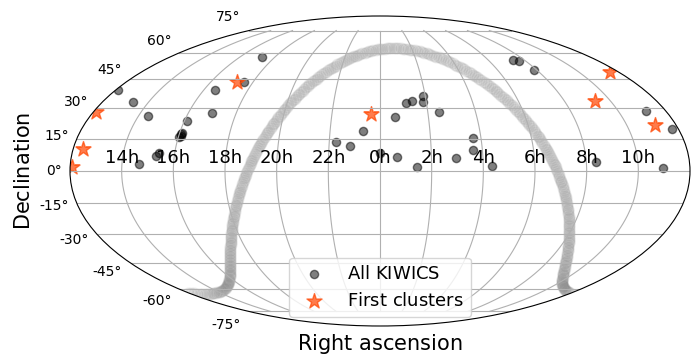 Map of the sky showing the clusters surveyed in KIWICS, and the eight clusters that have been already analysed. Credit: Pavel Mancera Piña. By analysing the general properties of about 500 newly-found UDGs at different distances from the centres of the clusters the researchers found several signs of environmental effects. The first result was that the larger clusters show a lack of UDGs in their centres. This is proof that the enormous gravitational forces present there are tearing these fluffy galaxies apart. Moreover they also found that UDGs away from the cluster centre are generally younger and have less concentrated stellar distributions, showing that the gravitational potential of the cluster, which is stronger close to the cluster centre, is changing the structure of galaxies, and is removing the interstellar gas, so that no new stars are being formed in the centres of clusters. In addition, they see that, as UDGs approach the centres of their host clusters, their morphologies are transformed from irregular discs to more spheroidal systems. In fact, for dwarf galaxies, which are similar to UDGs, but much smaller, observations in the literature give the same results. Figure 2. Left panel: Example of UDGs found in different clusters, the white lines show a scale of 5 arcsec. 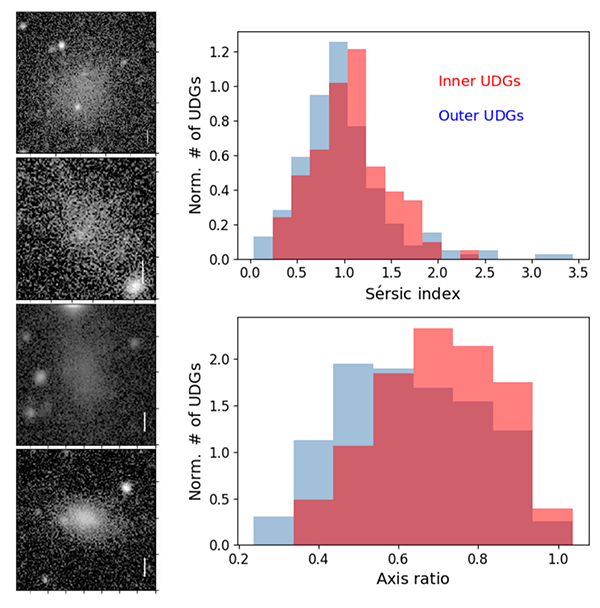 Upper right panel: The Sérsic index distribution (a measure of the light concentration of a galaxy) for central (red) and outer (blue) UDGs, showing that the galaxies in the central regions are more concentrated. Lower right panel: Axis ratio distribution of the two samples, showing that galaxies in the central regions are rounder. Credit: Pavel Mancera Piña. It is expected that the whole KIWICS survey will be finished at the end of 2019, just before WEAVE will be installed on the William Herschel Telescope. How many galaxies are now known to lie within our Local Group of galaxies? How does our Milky Way rank, size-wise? And what about the vast superclusters beyond? We know where our galaxy is located, but only locally speaking. The Milky Way galaxy is one of more than 54 galaxies known as the Local Group. The three largest members of the group are our Milky Way (second-biggest), the Andromeda galaxy (biggest) and the Triangulum Galaxy. The other galaxies in the Local Group are dwarf galaxies, and they’re mostly clustered around the three larger galaxies. The Local Group does have a gravitational center. It’s somewhere between the Milky Way and the Andromeda Galaxy. The Local Group has a diameter of about 10 million light-years. Astronomers have also discovered that our Local Group is on the outskirts of a giant supercluster of galaxies, known as the Virgo Supercluster. At least 100 galaxy groups and clusters are located within the Virgo Supercluster. Its diameter is thought to be about 110 million light-years. The Virgo Supercluster may be part of an even-larger structure that astronomers call the Laniakea Supercluster. It consists of perhaps 100,000 galaxies stretched out over some 520 million light-years. Deborah Byrd created the EarthSky radio series in 1991 and founded EarthSky.orgin 1994. Today, she serves as Editor-in-Chief of this website. She has won a galaxy of awards from the broadcasting and science communities, including having an asteroid named 3505 Byrd in her honor. A science communicator and educator since 1976, Byrd believes in science as a force for good in the world and a vital tool for the 21st century. “Being an EarthSky editor is like hosting a big global party for cool nature-lovers,” she says. In the [interactive in the full article, image above], you’ll notice the galaxies are moving toward something, a gravitational attractor represented by the big red dot more or less in the center of the mapped area (and in purple in the still graphic just above). This attractor is the Virgo Cluster, a large cluster of galaxies at the heart of the Virgo Supercluster (all located in the direction to the constellation Virgo in our sky; hence their names). Our home Milky Way galaxy (MW, yellow) and our companion Andromeda galaxy (M31, red) are participating in a downward flow away from a vast underdense region called the Local Void and toward the Virgo Cluster, represented by the large purple dot in this image. Most galaxies between us and the Virgo Cluster will eventually fall into the cluster but we lie slightly beyond the capture zone. Image via R. Brent Tully/ Institute for Astronomy, U Hawaii. Look at the [above] graphic, for the yellow letters marked MW. Our Milky Way is part of what’s called the Local Group, which spans about 10 million light-years and contains several dozen galaxies. The Local Group, in turn, is part of the Virgo Supercluster, which spans just over 100 million light-years and is thought to contain at least 100 galaxy groups and clusters. [The work] is part of a study by a team of astronomers from Maryland, Hawaii, Israel, and France. They say it’s the most detailed map ever of the orbits of galaxies in our extended local neighborhood. It shows the past motions of some 1,400 galaxies within 100 million light-years of our Milky Way. Over a thousand galaxies have already fallen into the Virgo Cluster, while in the future all galaxies that are currently within 40 million light-years of the cluster will be captured. Our Milky Way galaxy lies just outside this capture zone. However the Milky Way and Andromeda galaxies, each with 2 trillion times the mass of the sun, are destined to collide and merge [with each other] in 5 billion years. Bottom line: A team of astronomers has made the most detailed map ever of the orbits of galaxies in our local supercluster. It shows the past motions of some 1,400 galaxies within 100 million light-years of our Milky Way. Astronomers have discovered a giant cosmic void that explains why our Local Group of galaxies is moving through the universe as fast as it is. 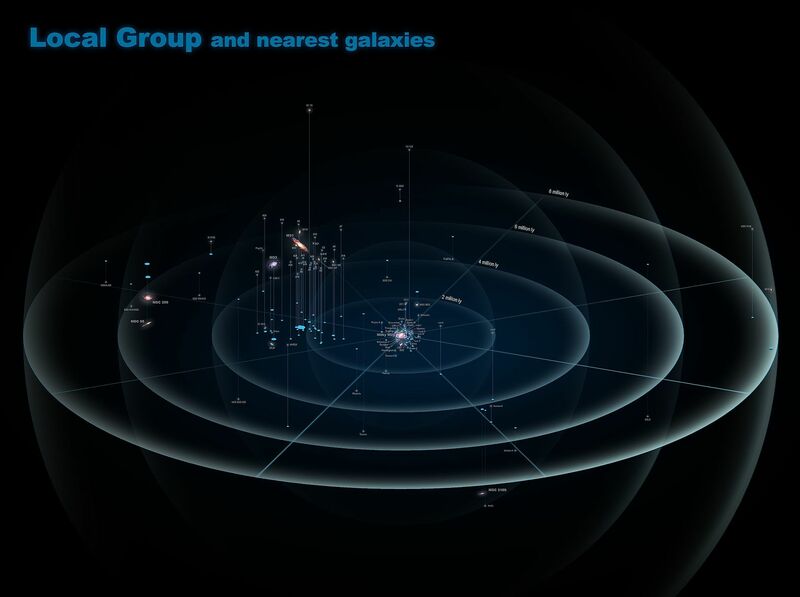 This visualization is a slice of the local cosmic structure, roughly centered on the Local Group. The black arrows show the “flow” matter follows in this gravitational watershed. Analysis of these flow patterns has revealed that there’s probably a large, unseen void (gray-brown at right) that is “pushing” us toward the Shapley Supercluster (green), which is in turn gravitationally pulling us toward it. The yellow arrow is the direction of the so-called cosmic dipole. The Milky Way Galaxy is one of the biggest galaxies in the Local Group, a modest cluster of stellar metropolises. The Local Group, in turn, lies in a filament of the much larger cosmic structure. The galaxy clusters in this cosmic web don’t stay still, but rather slowly gravitate (literally) toward the largest clusters. Astronomers have known since the 1980s that the Local Group is moving toward what’s called the Great Attractor, a dense collection in the vicinity of the Centaurus, Norma, and Hydra clusters about 160 million light-years away. They’ve also found another, equally influential attractor called the Shapley Supercluster, a huge structure along roughly the same line of sight but four times farther away. In 2006, when Dale Kocevski and Harald Ebeling (both then of University of Hawai’i) confirmed Shapley’s influence on the Local Group by mapping out how clusters clump together on the sky, they also saw hints of a void in the opposite direction. Now, using the Cosmicflows-2 catalog of galaxies, Yehuda Hoffman (Hebrew University, Jerusalem) and colleagues have mapped out the movements of more than 8,000 galaxies and confirmed that, yes, the two titans that determine how local galaxies flow through the cosmic web are Shapley and this single, as-yet unmapped void. Think of the local cosmic structure as a gravitational water park: the twisty slides start high (where the void is) and end up low (where the cluster is), with the natural motion always being down — that is, with gravity. Galaxies toboggan along the gravitational slides. But how fast the galaxies go depends on how tall the slides are. In the same way, the fact that there’s a big, “high” void in one part of the gravitational landscape makes the Local Group flow faster toward the dense, “low-lying” regions in the other direction than it would otherwise. The net effect is as though the void is pushing in the same direction as the supercluster is pulling. 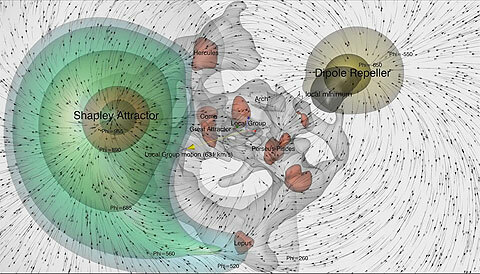 It may even be that the void, which the team labels the dipole repeller in their January 30th Nature Astronomy paper, has more of an effect on the Local Group’s motion than the Shapley region does on its own. This discovery actually may solve a longstanding cosmic conundrum. Astronomers knew that the Local Group moves with respect to the cosmic microwave background (CMB), the ocean of photons suffusing the universe that is left over from the Big Bang. This motion is called the CMB dipole. But the velocity (630 km/s, or 1.4 million mph) was about double what it should be, if Shapley and the other clusters were responsible. The repeller’s effect essentially doubles Shapley’s pull, explaining why the Local Group moves as fast as it does. The scientists responsible for the new 3D map suggest that the newfound Laniakea supercluster of galaxies may even be part of a still-larger structure they have not fully defined yet. “We live in something called ‘the cosmic web,’ where galaxies are connected in tendrils separated by giant voids,” said lead study author Brent Tully, an astronomer at the University of Hawaii at Honolulu. Scientists have created the first map of a colossal supercluster of galaxies known as Laniakea, the home of Earth’s Milky Way galaxy and many other. This computer simulation, a still from a Nature journal video, depicts the giant supercluster, with the Milky Way’s location shown as a red dot. This computer-generated depiction of the Laniakea Supercluster of galaxies, which includes the Milky Way galaxy containing Earth’s solar system, shows a view of the supercluster as seen from the supergalactic equatorial plane. Galaxies are not spread randomly throughout the universe. Instead, they clump in groups, such as the one Earth is in, the Local Group, which contains dozens of galaxies. In turn, these groups are part of massive clusters made up of hundreds of galaxies, all interconnected in a web of filaments in which galaxies are strung like pearls. The colossal structures known as superclusters form at the intersections of filaments. The giant structures making up the universe often have unclear boundaries. To better define these structures, astronomers examined Cosmicflows-2, the largest-ever catalog of the motions of galaxies, reasoning that each galaxy belongs to the structure whose gravity is making it flow toward. “We have a new way of defining large-scale structures from the velocities of galaxies rather than just looking at their distribution in the sky,” Tully said. 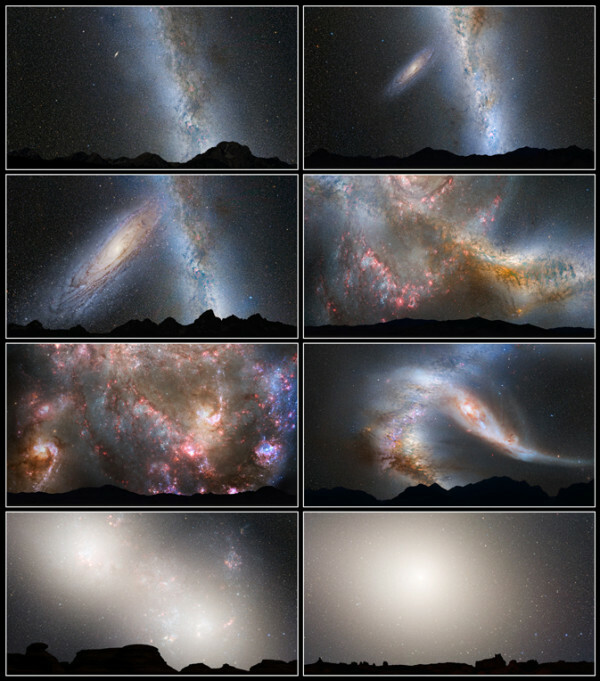 Two views of the Laniakea Supercluster, a massive collection of galaxies that contains Earth’s Milky Way galaxy and many others, are shown in these computer-generated images. The new 3D map developed by Tully and colleagues shows that the Milky Way galaxy resides in the outskirts of the Laniakea Supercluster, which is about 520 million light-years wide. The supercluster is made up of about 100,000 galaxies with a total mass about 100 million billion times that of the sun. The name Laniakea was suggested by Nawa’a Napoleon, who teaches Hawaiian language at Kapiolani Community College in Hawaii. The name is meant to honor Polynesian navigators who used their knowledge of the heavens to make long voyages across the immensity of the Pacific Ocean. “We live in the Local Group, which is part of the Local Sheet next to the Local Void — we wanted to come up with something a little more exciting than ‘Local,'” Tully told Space.com. This supercluster also includes the Virgo cluster and Norma-Hydra-Centaurus, otherwise known as the Great Attractor. These new findings help clear up the role of the Great Attractor, which is a problem that has kept astronomers busy for 30 years. 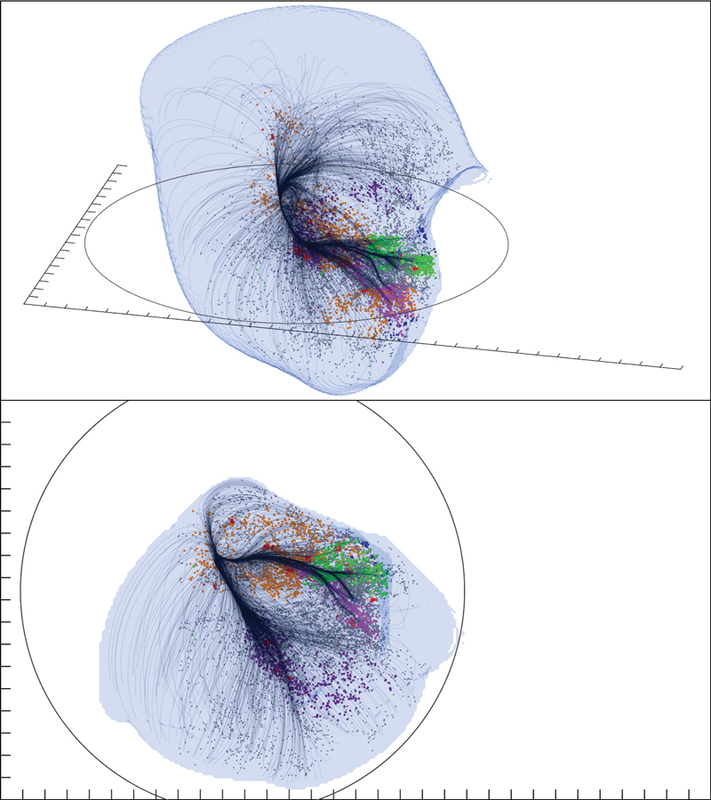 Within the Laniakea Supercluster, the motions of galaxies are directed inward, as water flows in descending paths down a valley, and the Great Attractor acts like a large flat-bottomed gravitational valley with a sphere of attraction that extends across the Laniakea Supercluster. 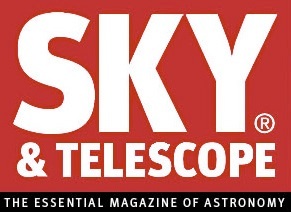 Panoramic view of the entire near-infrared sky reveals the distribution of galaxies beyond the Milky Way. The image is derived from the 2MASS Extended Source Catalog (XSC)—more than 1.5 million galaxies, and the Point Source Catalog (PSC)–nearly 0.5 billion Milky Way stars. The galaxies are color coded by redshift (numbers in parentheses) obtained from the UGC, CfA, Tully NBGC, LCRS, 2dF, 6dFGS, and SDSS surveys (and from various observations compiled by the NASA Extragalactic Database), or photo-metrically deduced from the K band (2.2 μm). Blue/purple are the nearest sources (z < 0.01); green are at moderate distances (0.01 < z < 0.04) and red are the most distant sources that 2MASS resolves (0.04 < z < 0.1). 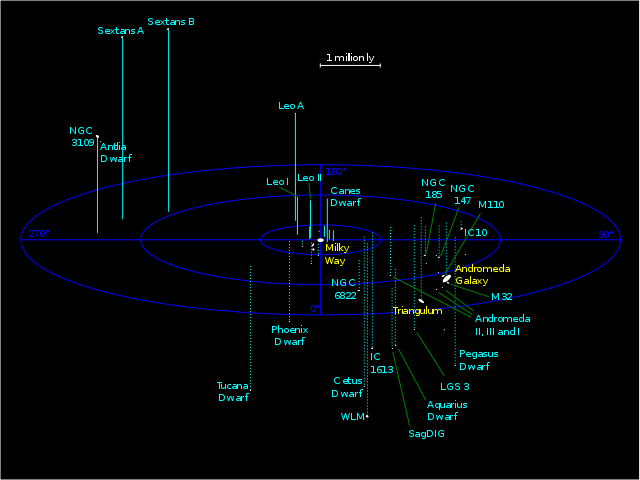 The map is projected with an equal area Aitoff in the Galactic system (Milky Way at center). Tully noted Laniakea could be part of an even larger structure. The scientists detailed their findings in the Sept. 4 issue of the journal Nature.